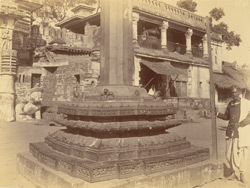 Photograph of the base of the Aruna-stambha in front of the Jagannatha Temple at Puri, from the Archaeological Survey of India Collections, taken by Poorno Chander Mukherji in the1890s. Puri, a town on the east coast of India in the state of Orissa, is one of the four traditional pilgrimage centres or 'dhams' for Hindus, and the centre of the cult of Jagannatha, a form of Krishna. The temple that enshrines the wooden image of this god dates from about the mid-12th century, although there were structures at this site prior to this. The main shrine, with its immense deul or sanctuary tower rising up to about 57 metres, and a jagamohana or assembly hall, is attributed to Anantavarman Chodaganga of the Eastern Ganga dynasty (r.1077-1147). There are two other main buildings, the nata-mandir or pillared hall for music and dance, and the bhogamandir or hall for the offerings, which date from the 15th-16th centuries. The rectangular complex has many other minor shrines and is within a high double-walled enclosure with four gates at the cardinal points. The elaborate Lion Gate or Singhadwara at the east is the main gate. The column in front of it, seen in this view, originally stood at the Sun Temple in Konarak. It is a multi-faceted column on a carved base with a figure of Aruna on top.